Margaritas, mariachis and Mexican food. This alliterative trio has become the foundation of what is the biggest Mexican holiday not really celebrated in Mexico. Yes, you are free to imbibe on cervezas and tequila on Cinco de Mayo, but that doesn’t mean you’re celebrating Mexican independence. What has become the corporate battle cry for Americans to take up arms-of lagers and margaritas-and celebrate our brothers and sisters to the South, actually has a much deeper meaning that might not warrant donning fake mustaches and sombreros. People also have forgotten the real Mexican Independence Day. The country declared its autonomy September 16, 1810, over half a century before the Battle of Puebla on May 5, 1862. Since 1825, September 16 has been a day of commemorating when the revolutionary priest, Father Miguel Hidalgo y Costilla delivered his “Grito de Dolores” from the pulpit, a decree against Spanish Imperialism. It is the Mexican “Fourth of July,” a national holiday where few businesses are open and governmental agencies shut down to commemorate their breaking away from Spanish rule. Cinco de Mayo,the day that the United States has re-branded as the hispanic sister to Saint Patrick’s Day-another confused American “holiday”-is remembered in Mexico as the day a rag-tag militia of Mexicans, lead by General Ignacio Zaragoza, defeated the invading French forces despite being outnumbered 2-1. The French, who invaded Mexico after President Benito Juarez claimed the country was too poor to pay its debts, were eventually victorious and installed a monarchy (with an Austrian king) that lasted about five years before. 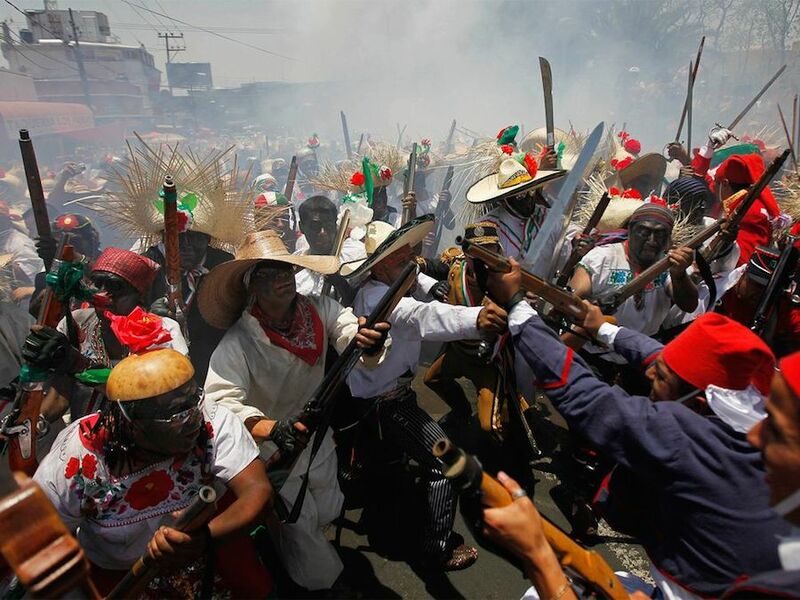 Still, the victory at Puebla became a symbol of Mexican resistance and the day that is still commemorated in Mexico with reenactments and parades, but mostly in the state of Puebla. Outside of that, the holiday is celebrated more heartily north of the Rio Grande. “Quite frankly, the reason I believe Cinco de Mayo is such a minor holiday in Mexico is that it’s an embarrassing holiday to Mexico,” Arroyo said. Rehashing the road that lead to the French invasion is painful for Mexicans. Mexico’s defeat and lack of patriotism during the Mexican-American War gave the country an aura weakness and indifference. The French invasion was by invite from a group of conservatives who lost the War of Reform in the late 1850s and preferred a French monarchy rather than let the liberals rule. To add to the indifference, one of the heroes of the Battle of Puebla, Porfirio Diaz, went on to become president, ruling the country as what many historians regard as a dictatorship from 1867-1911 before his exile to France. These are some of the reasons Arroyo stated as why the country might be hesitant to celebrate it as a whole. However, these dark periods of Mexican history are exactly why the state of Puebla does celebrate Cinco de Mayo, because after an era of lying down and being viewed as vulnerable, Mexicans stood up and defeated a world power when many didn’t expect them to even defend themselves. So how did Mexican patriotism jump borders and become such a big deal in the United States? During that same historical window the United States was enduring its own fight, with itself. The Civil War (1861-1865) was in full stride by the time that Zaragoza and his men defeated the French forces in Southern Mexico. According to the History Channel, when news of the French defeat spread to Union forces, some used it as a rallying cry as they fought the Confederacy. The proximity to the US and the fact that many states were once Mexican territories also contributed. Arroyo presents a more contemporary bridge for the holiday. The Chicano movement of the 1960s saw many Mexicans, especially in the Los Angeles area, feeling disenfranchised and exploited. Migrant workers who were fighting for voting rights and educational and workplace equality used sit-ins and protests to voice their plight and Cinco de Mayo as a vehicle to share their culture. According to Arroyo, the day also served as a reminder of the David versus Goliath battle that the Mexicans waged against French imperialism, and a vow that they wouldn’t give up their own struggle for a just cause. “Cinco de Mayo became one of the celebrations important to the Chicano movement as one of the ways to show other americans that Mexican Americans have long traditions of loving freedom and being willing to shed their blood to fight for freedom,” Arroyo said. Arroyo, who gave a presentation titled “Why We Celebrate Cinco de Mayo” at CSULB last weekend, says that people are usually surprised at the history surrounding the day. Often viewed as just another special day in the long line of celebrations on the U.S. calendar, it’s easy for the meaning of the celebration to be lost in the commercialization of the day. However, despite the loss of translation, the idea of the day is something that is valuable to everyone.